In the month of November of my seventeenth year, I left the Canadian metropolis of Montreal to go inhabit the lunar landscapes of Northern Alberta. My knack for adventure had propelled me to subscribe to a youth program where locations were picked for the participants after their acceptance into the program, which was aimed at a bunch of 17 to 21 years old who were about to live three months in three different Canadian locations for a total of nine months. It was not the first time that I ever left home without any family, but this time, it was about to be a long and far-flung adventure, and anything seemed possible. At the Montréal-Pierre Elliott Trudeau International Airport, I instantly recognized two girls from the same program as me because of their badges sewn onto their backpacks and tuques, and so the three of us embarked on our first flight of the day together. We landed in the snow in Calgary, quickly grabbed a coffee and boarded another plane to Grande Prairie. The plane was noticeably smaller that its predecessor, and its passengers consisted almost exclusively of fellow young participants and their accompanying authority figures. We talked, laughed and interviewed each other. Me and the girls even did rounds to get a view from the window. Of course, we were a very excited bunch, deserting our hometowns, starting ourselves anew. It was the beginning of what already seemed like a year-long summer camp for late teens. We arrived in Grande Prairie at night in the tiniest airport, one without chain stores, long corridors or hundreds of people. Instead, the airport consisted of one huge room and a snack bar atop a mezzanine. There were now about thirty to forty participants hanging out there, clustered on leather seats in the common public space next to the greasy spoon. The bunch of young folks, waiting to depart to their respective destinations, was sprawled in different directions, speaking French or English, and more rarely both. One of the purposes of the program was that the participants would become bilingual by the end of it, which was bound to happen, but as nerves were sensitive and travel exhaustion felt, most people kept to themselves. A couple of minutes later, I embarked on a couple of charter buses and, while the first group was dropped in Grande Prairie, mine stopped at Falher and the other group was bound to settle in Peace River. The first thing that really hit me was the lack of light: there was not a single spot in sight in the few hours of bus after Grande Prairie. The only lights came from oil tanks at the side of the road and even more rarely from garages and convenience stores. The moment was quiet and kind of scary. I felt like I was about to live in the middle of nowhere (which wasn’t that far from the truth, come to think of it), while also feeling incredibly tiny in the infinite land. We finally made it at the house, bleary-eyed, and were divided into three different rooms: three girls in two rooms, and the boys downstairs. The beds, made of white-painted metal, were noisy and uncomfortable. We were just about to start our own family in this house as we got accustomed to live together in it, doing various volunteer jobs during the day, and coming back at night. There were always a team of two that had to clean the house and make food daily, and we even learned how to bake our own bread. The times were the most joyful with the group. There wasn’t a city to discover, and that helped us to bond. We were always playing in the snow like there was no tomorrow: having snow fights, making angels in the snow, going for walks. At one point, we even witnessed white and green Northern lights on a nightly walk. The sky was gigantic in proportion to the flat land and the connection to it was primordial in a way that doesn’t happen when surrounded by tall buildings. The sense of space was all-encompassing, as if the sky could dictate our moods and lifestyle. The program was a moment of togetherness, despite our differences of language, culture and hometown. We were always traveling in a mini van, doing various activities such as swimming or thrift-store shopping. Alas, the summer camp for late teens also came with a downside and its share of boredom: the volunteer work I was doing involved too much time spent on MSN chatting with my friends back home and not enough time being challenged. I learned to become happy in everyday life, with such small events as coffee breaks with fellow coworkers, but my gut was telling me that I needed to get out. As days went by, I realized that although I loved the group, I didn’t like how the organization was ruling our lives. I increasingly started feeling like an inmate living by strict regulations instead of living a grand adventure. I thus announced my departure and then, two days before Christmas, I was officially kicked out of the program. Luckily, I was taken under the wings of my lovely coworker, Yvonne, who had the same age as my dad’s but was already a grandmother many times over. Yvonne and her retiree husband’s André lived in huge house and they even had prepared a plush guest room for me. After sleeping on a bunk bed for weeks, the queen-sized bed felt like a dream. I spent Christmas Eve with the couple’s family: their children and grandchildren came along for an evening of fun, gift-giving and card-playing. The whole family made me feel more than welcome, and it was the best gift I could have received that year, miles from home. It was another kind of Canadiana Christmas, not the typical Québécois one I was used to, but still one where food was abundant (there was a chocolate fountain!) and laughs galore. On Christmas day, I returned to the group’s house to hang out with everyone. It was beyond frozen, and energies at the house were low as we watched movie after movie. I felt a tinge of melancholia as I saw the group together for the last time, while simultaneously feeling ready to face loneliness, challenges, and independence. 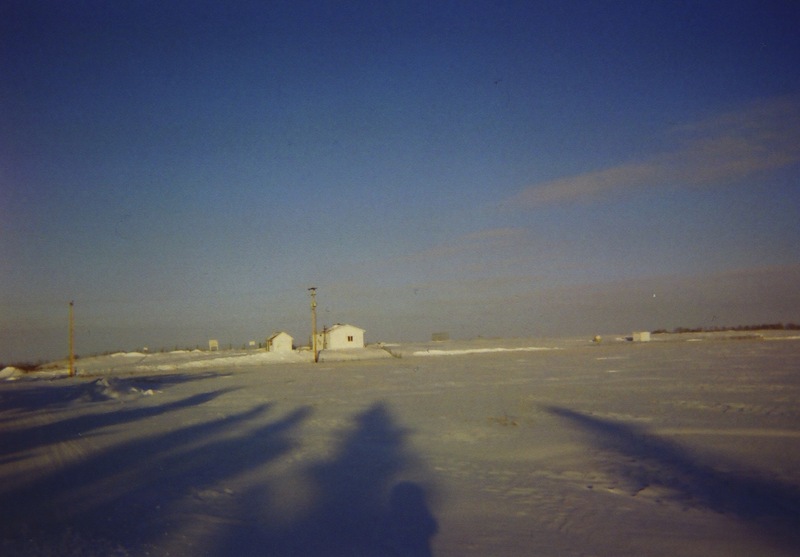 On December 26th, around 5 AM, Yvonne dropped me to the bus stop, direction Edmonton, where I had a plane to catch. I was so lucky that, when transferring my ticket booked by the organization to my hometown, an engaging young man decided to give me a first-class seat, with the explanation: ”it’s Christmas, right?”. In the bus, sunrise was starting to work its magic. For the last time, I got completely immersed in the boundless landscapes of the Northern part of the province. I made it to the airport, and it was the first time that I was boarding a plane on my own. I remember writing in my notebook, sitting in the luxury lounge, feeling so many emotions at once, something that was to become frequent in following trips. The plane ride was short and sweet, under an hour and a half and filled with fresh coffee, crudités, the Vancouver Sun and a warm towel to watch my hands. I felt like I was becoming a grown-up. I arrived in Vancouver in a overcrowded airport, and got picked up by a friend of my mother’s, who lived there since years. That night, at his place in the suburbs, I went to sleep with a smile on my face, proud of such a huge change in a matter of days. The next morning, I woke up at dawn armed and ready with a considerable pile of CVs. I walked outside, looked at the lush West Coast vegetation, embarked on a bus and went on exploring. It was a brand new day,Vancouver was just about to be discovered and I was learning (somewhat intensely) how to be a grown-up. Lili Monette is a born-and-raised Montrealer and an artist by DNA and by choice. She holds a Bachelor’s of Fine Arts in Theatre and Development from Concordia University and can be found around the world entertaining people and gathering stories.